Vie ferrate are a way of enabling access to mountainous areas that would normally only be accessible to experienced mountaineers or rock climbers. These “iron roads” have a mixture of attachments to the rock to help people climb past the sections where the rock climbing is a bit harder. These can include stemples (i.e. giant, metal stables), ladders and wire bridges. 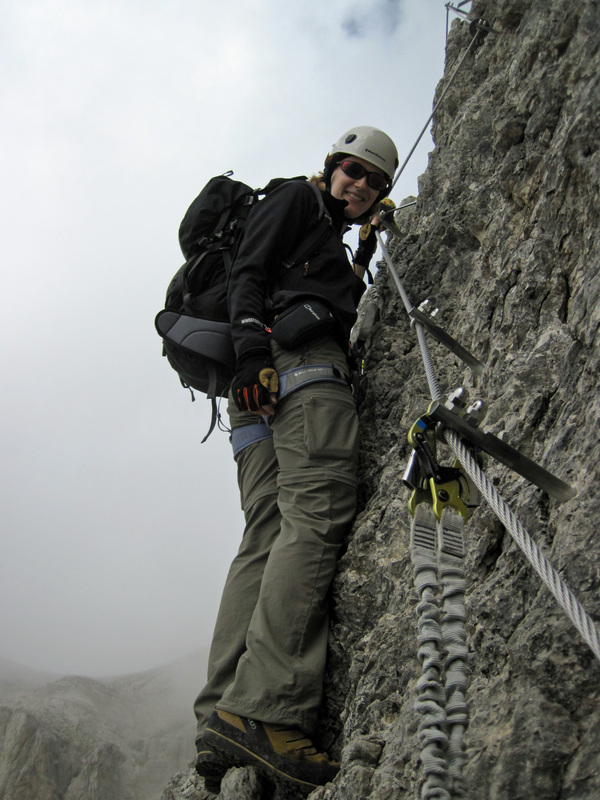 To ensure safety, a metal cable is pinned at intervals to the mountain or rock face. Someone climbing a via ferrata attaches themselves to this cable using specialist equipment called lanyards. These are essentially two arms of tough fabric, which is often elasticated. Each lanyard ends in a locking karabiner for attaching to the cable and they join together at a kinetic energy absorbing device. These lanyards are attached to a climbing harness worn by the person climbing the via ferrata. The karabiners slid along the cable and, when one of the pins is reached, first one, and then the other karabiner is removed and clipped again past the pin. This ensures that there is always one karabiner attached to the cable in case of a fall. There are several forms of lanyards, but all basically work by stopping a long fall by having the karabiners catch on one of the pins holding the cable and absorbing the energy generated. There is a good explanation of how lanyards work (with some useful diagrams) on the Black Diamond website. On 5 August 2012, near Walchsee in the Tirol region of Austria, a set of these lanyards didn’t stop a fall. The lanyards snapped and the climber died. Investigations are still going on as to what exactly happened, including an investigation by the local prosecutor. However, what is known comes from investigations by the company that made the lanyards, Edelrid, the industry and safety standards body the UIAA (Union Internationale des Associations d’Alpinisme – International Mountaineering and Climbing Federation) and the German Alpine Club. They have stated that the accident involved the lanyards breaking due to both the intensive use they had been subjected to and the materials used in their manufacture. The German Alpine Club has said that repeated stretching of the lanyards during use led to a reduction in the strength of their fibres as elastic and strength-bearing threads rubbed against each other. As the lanyards involved in the accident were rented, it was speculated that they had received more use. Edelrid rapidly issued a recall for all its via ferrata lanyards made using the same methods as those involved in the accident. Over the coming weeks, there were product recalls from Wild Country, AustriAlpin, Singing Rock, Climbing Technology, Edelweiss, Ocun and, recently, Mammut. It’s probably fairly safe to say that these recalls have cost these companies a fair bit of money as they try to maintain consumer confidence in their products and in the safety of vie ferrate. For them, this brings to mind other recall crises for companies. To deal with this, there was an emergency meeting of the Safety Commission of the UIAA in September 2012. This led the UIAA to announce it would review its UIAA 218 safety standard (the one that applies to energy-absorbing devices, including via ferrata lanyards) so that it would now include a fatigue test. The German Alpine Club also, apparently, worked during this time with a laboratory to develop a new test procedure for the long-term use of lanyards. In October, Edelrid stated that it had developed new lanyards that passed, and even exceeded, this new test. They also stated that all the lanyards they had recalled, and have been returned, had been reworked with these new lanyard arms. This rapid response from all concerned is worthy of praise. It could be seen as putting this matter to rest, if it were not for what else Edelrid had said in its statement and the uncomfortable issues this whole episode throws up. It seems to be fairly widely accepted that vie ferrate have become more popular in the last few years. This is understandable because vie ferrate is incredibly fun. Vie ferrate have the thrill, challenge and joy of movement on rock that comes from rock climbing, but without all the equipment and the need to belay that comes with rock climbing. A lot of climbers do vie ferrate. They also provide a way into the high mountains and onto more severe terrain for many people who might otherwise only get as far a viewpoint or be walking on a trail. It’s in relation to these people, who maybe come to vie ferrate very occasionally, that issues arise. This is because they are less likely to own via ferrata lanyards and so are more likely to rent them. The challenge referred to by Edelrid is that rented lanyards are likely to get considerably more use than they would do if owned by an individual. The old safety standards were just not written with this sort of usage in mind. With the new safety tests and standards being developed, it looks like this issue is being dealt with, but Edelrid pushes the issue further in its press release. 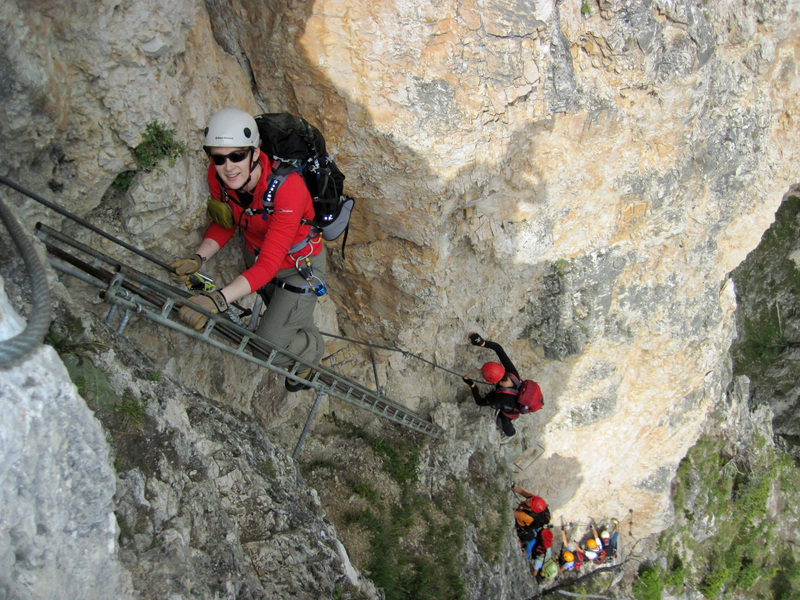 The implication of these statements is that many of the businesses renting via ferrata lanyards don’t employ qualified people (such as the guides that are employed by a mountaineering school), may not know how to manage equipment to ensure it’s safe and aren’t regulated by any authority that can get them to behave safely. If you’re a cynic, you might think Edelrid is just trying to shift the focus (and maybe any blame) away from itself and other manufacturers and onto the small businesses that rent lanyards. There might be some truth in the idea that shifting the debate is in Edelrid’s interests, but Edelrid also has a point. Vie ferrate lanyards are used to save people’s lives. They need to be in working condition and retired when they become unsafe. The people who rent lanyards have no choice but to trust that what they are renting is safe to use. They don’t know the history of what they are renting and can’t check the lanyards with a microscope to make sure they will work in a fall. This raises questions of trust and responsibility. Manufacturers and the many businesses that profit from vie ferrate (rental companies, mountain guides, mountaineering schools, rifugios, campsites, etc) need people to trust in vie ferrate and the equipment you need to do it if they are not to lose custom. In addition, mountain communities need people to feel comfortable doing vie ferrate while on holiday if they are to get the tourist income they often depend on. With this comes the need to earn this trust through responsible behaviour. It’s perhaps worth asking if manufacturers did behave responsibly by not looking to how their products were being used and anticipating that they needed to change them to ensure they were safe. However, the rapid and widespread recalls of lanyards and quick commitment to review standards is very responsible. It also, rightly, keeps the focus on preventing more accidents. Whether rental businesses are only renting safe equipment is something I doubt anyone knows at the moment. The only they may be able to clearly demonstrate responsible behaviour and so ensure public trust in their business is to accept some form of regulation. However, with vie ferrate spread over many countries (mostly in Europe), there are questions about who and how this regulation might be done. In addition, there may be some mountaineers and climbers who may question whether there should be a rental business for this sort of equipment at all. Doing a via ferrata involves a lot of risks and the possibility of some pretty nasty consequences if something goes wrong. To manage those risks requires knowledge, skills and (some) specialist equipment. It may be that a person who does mountain sport so infrequently that they rent lanyards doesn’t have these things. Some might argue that they should either be informed or not go up a via ferrata. This gets to the issue of the accessibility of the mountains. Probably more than any other mountain sport, vie ferrate make alpine environments and steep rock faces accessible to wider group of people. 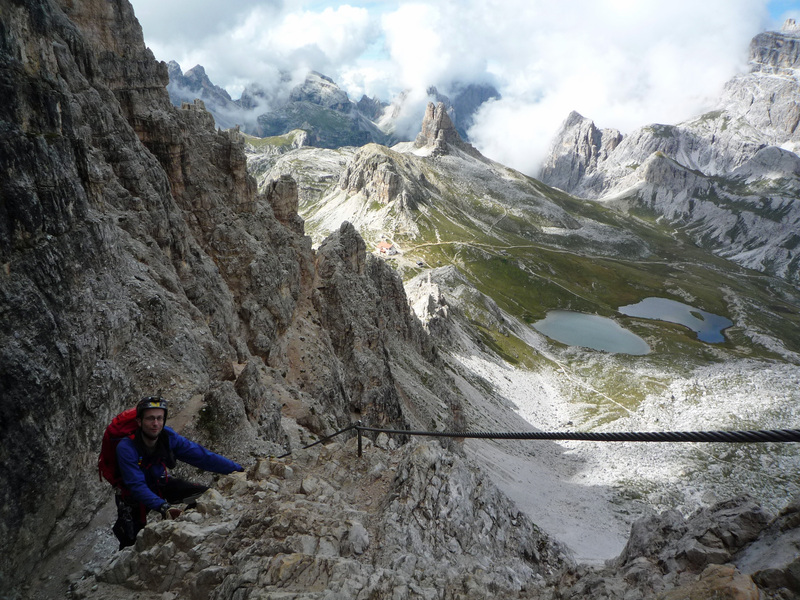 The ability to rent lanyards in turn makes vie ferrate more accessible by allowing people to spend a day or two out on a via ferrata as part of their holiday. There’s something great about mountains being there for anyone to explore and enjoy. There is also the need to ensure that people can enjoy these mountains safely. Safety and accessibility should be balanced by looking to how those people who want to do a via ferrata can have safe equipment and know how to use it. The need to maintain the trust of their customers ensured manufacturers recalled their products quickly and this need for trust can have some influence on the rental sector. However, with this sector so disparate and the high stakes involves if these businesses don’t respond this pressure, other incentives (like regulatory action) may be needed to prevent another tragedy. Mountain sports have always had to balance people’s desire for adventure and to enjoy the mountains with questions about how to ensure safety. This is often a difficult balancing act in which some risks are accepted. As the consequences of these events continue to play out, it would be a shame if the mountains became less open or less safe. You can read my first post on these recalls and the issues involved here and an update to this post here. UPDATE: there has been a further wave of recalls of via ferrata lanyards and you can find out more about this by clicking here. UPDATE 12 June 2014: Edelrid is now selling a set of via ferrata lanyards specifically designed for use by the rental sector. Edelrid says that its Cable Rent set has lanyards “made of double-layer, stitched thermofixed polyamide” and that this “redundant design prevents wear.” It also says that the webbing of the lanyards has a 22 kN breaking strength even if only one of the lanyards is attached to the cable (with the other being attached to the harness). Plus, there is a visible label that breaks if the set is shock loaded and a template for use in a logbook to document the usage of the set, together with instructions for inspecting the set. This is a really interesting example of a manufacturer trying to address issues with the safe use of its products. Edelrid seems to have considered the wear issue, the problem rental customers have in not knowing the history of a set of lanyards and the ability of someone renting a set of lanyards to ensure that these sets are safe. It’s a bit hard to know how much difference this will make, particularly as it requires rental companies to buy this product over others in the market if it is to make a difference, but it’s a worthwhile effort. An important area for discussion and common sense approach. Thanks. Too many people seem to go up vie ferrate without a full understanding of the risks. A great report on the issue and tragic event….thanks! Yes,i agree that rental sector needs regulations but how? Personally i trust mountaneering schools and mountain guides because they follow their clients step by step during the excursion,they are rescue members as well and know what to do in case of accident. Renting via ferrata lanyards or piolets and crampons,often necessary till mid-summer or to deal with glaciers (vie ferrate in Marmolada,very frequented by tourists and by me too),involves many potential risks as such gear can’t be used with enough safety if we do vie ferrate twice a year or so. Vie ferrate have been built to enable people’s access to the summits and to push tourism,it’s a reality i can’t deny,but the sense of being in the mountains is something we can’t rent or buy. One way of regulating the rental sector might be to require anyone who rents vie ferrate gear to be registered. A condition for registration could be to care for the gear properly, including recording its history and retiring it when it was no longer safe. Something like this would inevitably increase costs for the rental sector, but it might increase safety too. It’s at least an option. Your comments on this issue are actually impressing and product recalls from Edelrid,Edelweiss and Mammut even more astonishing for their tradition on mountain gear,work and rescue products included. Placards have been placed along the trails leading to vie ferrate in Dolomiti and i guess all over the Alps;alpine clubs,guides,manufacturers are concerned on prevention. As for rental sector,i haven’t accurate information so i’ll decidedly ask the local alpine club and mountaneering school i belong to,a couple of professional guides and a gear shop to know how things should work for a safe “adventure”. It’s good that there are signs and such effort is being made to inform people. Well,i have asked around and i had more or less the same answer:lanyards are returned to the producer once a year for checking and used for three or four years,depending on model,after that most of producers don’t consider them any safe. Evidently this is not enough to ensure safety especially when clients are left all alone with their brand new,in terms of experience,lanyards but there are no precise regulations for this rental sector. Some gear shops i have visited rent Camp Rewind sets,which have an indicator for fall factor shocks,others simply have given up renting and it’s the best decision,to be honest,while mountaneering schools and guides are clearly a different situation not only because they follow their clients and are penally responsible but for the clean approach to the mountains they almost always teach. This is,in my opinion,the first step to that,more than ever valid,Mummery’s “by fair means” climbing and true safety. Thanks Paolo – it’s good of you to look into this. I’m pleased that rental places are doing things to check the lanyards are safe. It’s also interesting to know that some of the gear shops have given up on renting lanyards (perhaps it’s just too much effort?). Perhaps both too much of effort compared to earnings and too much of responsibility considering those massive recalls and the fact that renting such equipment is quite unusual;moreover vie ferrate don’t mean that much for rental places,compared to ski and last but not least,the mountain rescue problems potentially involved.